Let’s select song keys with a comfortable singing range for the congregation. The band is too loud when we can’t hear the congregation sing. Let’s sing fewer songs this week to allow more time for Scripture and Prayer. We’ve learned enough new songs for a while. It’s time to learn some new songs. I love my pastor and pray for him daily. We don’t sing songs that aren’t biblically accurate or theologically sound. Please remain seated if that is more comfortable for you. I am interested in what everyone else thinks. No, that is my family time. Let’s get some feedback from the senior adults. We need to celebrate the Lord’s Supper more frequently. Instead of making changes, let’s get better at what we are already doing. It’s Monday and the worship service is already planned. I never want what I wear to distract or detract from worship. I love it when the house lights are up so I can see their faces. Not every great worship song is great for congregational singing. Even if I don’t know or like the songs, I’m still planning to sing them like I do. We’ll take care of your kids so you can go on a date with your spouse. I bought you a Starbucks gift card. I’m praying daily for you and the worship team. I’ve been singing that new song all week. We love using the Sunday song set for family devotions. Thanks for selecting older and newer songs with biblical integrity. You are a great guitar player but an even better pastor. I love that our worship emphasizes theological content instead of musical style. I’d like to volunteer to serve on the tech team. Will it encourage passive spectating or active participating? Does it include a healthy balance of familiar and new? Does it include expressions that are both celebrative and contemplative? Are its texts theologically sound and do they affirm scripture as foundational? Is it culturally and generationally appropriate for those who will be present? Does it include not only our words to God but also God’s words to us? Will acceptable physical actions be articulated or implied? Will it give participants an opportunity to connect with each other? Will its musical or technological elements direct our attention away from God? Are its melodies singable and ranges accessible? Will guests be able to participate in it without confusion? Will it speak and teach the Gospel? Will it engage more than just emotions? Are we giving it too much responsibility for the entirety of our worship? Will it encourage participants to be doers of the word and not just hearers only? Why Are We Praying Less and Singing More? Prayer has been demoted to the role of a worship service starter, stuffer, and stopper. Instead of a profound conversation with the Father as a primary act of worship, it has been plugged in as a transitional appendage. So it serves as the seventh inning stretch before the sermon; it breaks up the song sets when keys aren’t relative; it moves the worship band on the platform; and it allows the pastor to discreetly make his way up the aisle to shake hands after the service. Maybe we are singing more and praying less because our worship service prayers are not that deep. Song texts have been parsed, prayed over, and practiced, while our prayers are often played by ear. The spontaneous prayer may be sincere, but it’s often not very profound. Spontaneity needs to be supported by an intense prayer life. It’s hard to go where you haven’t been. Maybe we are singing more and praying less because prayer is an easy language to fake. We can pretend to pray, use acceptable words of prayer, practice forms of prayer, assume postures of prayer, acquire a reputation for prayer, and never really pray. Maybe we are singing more and praying less because we actually require our soloists, choirs, orchestras, worship teams, and bands to rehearse ahead of time. So if worship service prayer preparations were as stringent as those for our musical offerings, then maybe we’d consider singing a little less in order to pray a little more. Then maybe our worship service prayers would again be considered foundational instead of supplemental. Hughes Oliphant Old, Leading in Prayer: A Workbook for Worship (Grand Rapids: William B. Eerdmans, 1995), 5. Eugene H. Peterson, as quoted in Harold M. Best, Dumbfounded Praying (Eugene: Wipf & Stock, 2011), xii. Large Church Worship Leader Wannabes? Um, No! Brent was recently called to serve as the full-time worship pastor for a large church. He is responsible for multiple worship bands, multiple choral groups and multiple services. Brandon was recently called to serve as the volunteer worship leader for a small church. He is responsible for a keyboard, cajon and whatever singers he can recruit each week for a single service. Brent and Brandon have both responded to a divine calling to lead worship. So who’s calling is more significant? The usual perception is that a bigger church is always better or size determines significance. So smaller church leaders are often viewed as mediocre representations of larger church leaders, as worship leaders in waiting, as juniors to their senior counterparts or as large church wannabes. But church statistical information doesn’t agree with that perception. Actual figures indicate that 95 percent of American churches average 350 or less in worship and 75-80 percent of those congregations average 150 or less. And according to a recent study from the Hartford Institute, more than half are under 100. So instead of being second-rate, those smaller church worship leaders actually represent the norm or largest majority of churches nationwide. Small church worship leaders are often like Angus MacGyver, the secret agent in an action-adventure television series in the ‘80s. MacGyver was able to find clever solutions and solve complex problems with whatever he had on hand. If he wanted to survive each week, he created something unbelievable with what was available. Worship leaders in smaller churches have realized that loving God and their neighbors is never contingent on congregational size, resources or abilities. And they are usually accomplishing successful worship ministry every week while holding down a full-time job outside the church. So instead of large church wannabes, they are worship leading heroes and models for ministry success who daily respond to God’s call to use what they have where they are. The need for an earthly mediator to facilitate our encounters with God or dispense His grace to us was set aside with the advent of the gospel. Now Jesus serves as our intercessor sitting at the right hand of the throne of God. So worship leaders and the songs they sing can’t usher us into the presence of God, the death and resurrection of Jesus already has. When we ascribe that power to earthly leaders, we begin to see their leadership as something that is meritorious or efficacious, meaning their actions are praised for what they can produce. Those worship actions can indeed prompt, exhort, encourage and remind us of God’s presence but they can’t generate it or lead us into it. In the old covenant, access to God was limited. Only the high priest was allowed into the Holy of Holies one time a year with a blood offering (Heb 9). But in the new covenant the earthly priest was no longer required; the sacrifice was complete; Jesus’ blood was offered; and the way is open to worship Him without an earthly intercessor. God’s presence isn’t a physical place we attend or an emotional plane we achieve so we don’t go to it, sing it into existence or usher people into it. Instead, we have confidence to enter that holy place only by the blood of Jesus. And as our usher, He then is not only the object of our worship but also the facilitator of it. Adapted from D.A. Carson, ed., Worship by the Book, (Grand Rapids: Zondervan, 2002), 50. Do you have a hard time retaining worship volunteers? Is it possible the reason they aren’t staying isn’t their lack of commitment or conviction, but instead something you as their leader are or aren’t doing? If you want to regularly replace volunteers in your band, worship team, choir or tech team, then try some of the following. Are you critical when volunteers can’t imitate a worship model you consider successful? Is it evident you are disappointed when they don’t measure up to your expectations? How well would comparisons like that work in your marriage? Your lack of preparation indicates either laziness or arrogance. Both reasons convey that your time is more valuable than theirs. And being an artist and a leader doesn’t give you permission for either one. Why wouldn’t they assume expendability if you treat them like they are the undercard to your main event? You might have enough talent to succeed alone, but that is not what you have been called to do. Serving as a worship volunteer is their response to a divine invitation. Since volunteers serve because of calling they should never be treated as just volunteers filling a vacancy. Your worship volunteers are instead ministers fulfilling their mission. Yes, it’s true their service is for God, not you. But they still need you to affirm them regularly, intentionally and meaningfully. They need to know their contributions are fulfilling expectations, are valued multilaterally and are making an eternal difference. Don’t forget volunteers also have jobs and families when you are scheduling them for multiple services every week and rehearsals that always run long. Enlist a large enough pool of volunteers for a rotation to give them a break. Leading like you alone have the ability, creativity and even right to be the sole worship proprietor means you are guarding your status, not leading others. Entitlement and control may achieve compliance for a short time but rarely the buy-in of a long-term commitment. If worship volunteers aren’t validated in the ministry you lead, then they will look for another ministry where they are. It is recorded at the beginning of chapter five of Ecclesiastes that we should guard our steps as we go to the house of God and listen instead of offering the sacrifice of fools who don’t even know they are being foolish (Eccl 5:1). Understanding the necessity of individually preparing for gathered worship is radically different than expecting our worship leaders to generate our worship for us when we get there. We sing our songs as an act of worship, not to create it. 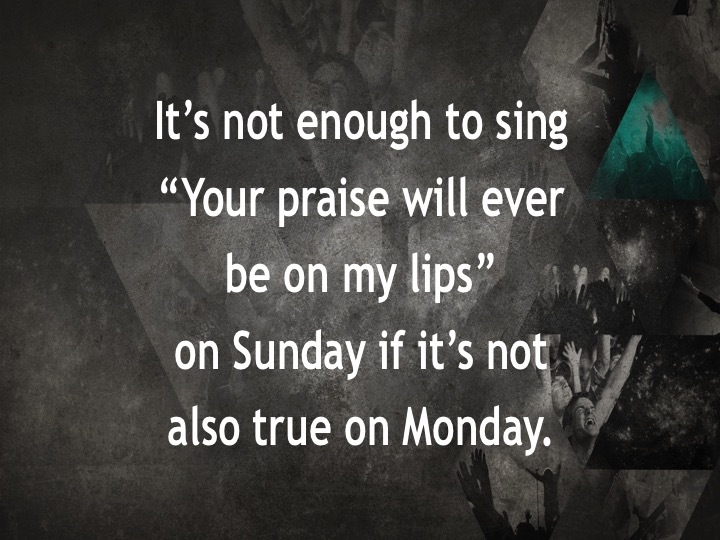 It’s not enough to sing “Your praise will ever be on my lips” on Sunday if I’m not living it on Monday. So if we aren’t prepared on Sunday to respond to God’s countless blessings that occurred all week, how could our worship leaders possibly lead enough songs to prepare us? Internal preparation of heart: Each worshiper carries the responsibility for personal preparation of his/her heart. If God calls us to worship him “in spirit and in truth” (John 4:24), then we must constantly ask questions about the state of our spirit and readiness of our hearts. Pre-arrival preparation: We can learn from the Jews who believe the Sabbath begins at sundown the evening before. So our Saturday night and Sunday morning activities before we gather have a formative affect, positively or negatively, on our readiness for worship. Pre-service preparation: That short period of time between our arrival at church and the beginning of the worship service is also critical. How we interact with others reminds us that we are here as part of a body. Intentionally quieting our spirits before the service begins will also enable us to set distractions aside and again focus our corporate attention on God. And since worship does not start when we enter the worship service, it should not stop when we leave. So with that understanding I would recommend a fourth suggestion to add to the previous three. Post-service continuation: Worship should continue as we leave the service. It can happen in our homes, at our schools and through our work. It can’t be contained in a single location, context, culture, style, artistic expression or vehicle of communication. So it doesn’t matter how good our worship is when we gather, it is incomplete until it continues when we scatter. Post-service worship then leads us in a continuous circle back to step 1. Worship begins in our hearts, not on our lips. Richard Foster, Celebration of Discipline (San Francisco: HarperCollins, 1978). Malefyt, Norma deWaal and Howard Vanderwell, Database online. Available from worship.calvin.edu. Target his family because you aren’t happy with him. Insist on worship service musical style quotas. Constantly compare her with your previous worship leader. As an act of civil disobedience stop singing when he introduces new songs. Don’t accept his limitations, vulnerabilities or transparency. Expect the worship music to increase church attendance or reduce church conflict. Depend on her alone to generate or create worship every week. Demand intergenerational worship that doesn’t require you to sacrifice. Expect her to lead multicultural worship without changing anything. Require him to always plan and lead worship with your preferences in mind. Institute ageism and physical appearance guidelines. Never view worship as more than a service starter, stuffer or stopper. Planning worship just to perpetuate past feelings or promote future ones are both worship killers. Nostalgia is sentimental remembrance of previous times or significant events that continue to stir happy or meaningful personal recollections. Nostalgia in reasonable doses can provide a sense of comfort. But too much can have a negative effect perpetuating the belief that an earlier time is preferable to present day conditions. Excessive nostalgia as it relates to worship can cause a congregation to romanticize, idealize and even embellish past worship practices in an effort to coerce present generations to perpetuate that past for future generations. Nostalgically extending previous practices has the potential to limit a congregation to its past performance, potentially killing present and future worship efforts. The end result is worship that attempts to re-create divine moments, events or even seasons based almost completely on the idealized emotions that were originally stirred. Novelty is the quality of being new, original or unusual just to be new, original or unusual. A novelty entertains for a short period of time until another novelty surfaces. College freshmen enjoy the novelty of independence until they have to do their own laundry. A child’s birthday present is novel until he opens the next one. Novelty as it relates to worship can cause a congregation to over innovate, over stimulate and over imitate. Each Sunday then becomes an exercise in surpassing the creativity of the previous Sunday. So when excessive worship novelty occurs our focus is often on the creative instead of the creator. It looks as if those who lead worship believe people can be lured by incessant brightenings, lightenings, lengthenings, abridgements, simplifications and complications. Novelties such as these are often inserted for their entertainment value. 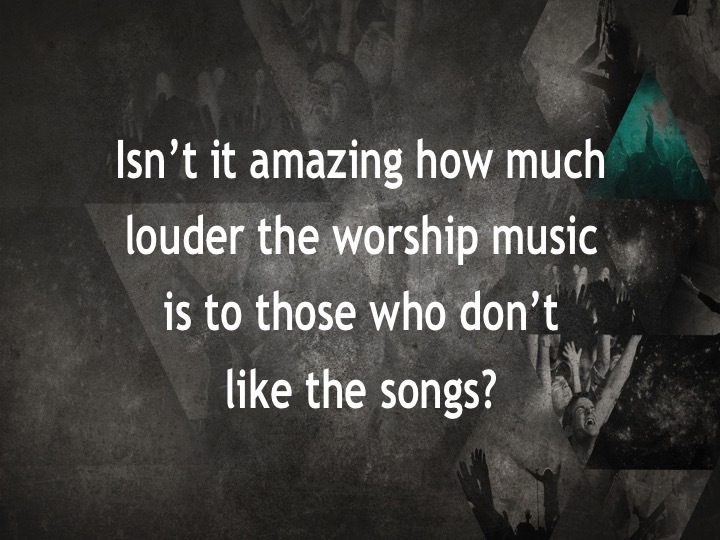 But worship is not about entertainment. The charge to Peter was feed my sheep; not try experiments on my rats, or even, teach my performing dogs new tricks. Adapted from C.S. Lewis, Letters to Malcolm: Chiefly on Prayer (San Diego: Harvest, 1964) 4-5. Crowdsourcing is an intentional process of obtaining ideas, creativity and evaluation from a large group of people. The principle of outsourcing to a larger crowd is that more heads are better than a few. In other words, canvassing a larger and more diverse crowd of people could encourage a superior quality of idea generation and content evaluation. One of the premier examples of crowdsourcing is Wikipedia. Instead of hiring writers and editors to create an encyclopedia, Wikipedia offers a crowd the opportunity to create and moderate information on their own. The result is a backless encyclopedia. Those of us who plan and present worship usually determine its success or failure solely on our own observations. If congregants attend, move their lips, lift their hands and don’t often complain about the songs or sound, then we assume the worship was good. So worship evaluation and our response is based primarily on their presence and perceived participation. But if the structure and content of our worship service is always determined by the evaluations of the same select few of us, then our worship reality is limited to our assumptions. And those sometimes-shallow assumptions can blind us to worship that may not actually be occurring. Involving our congregation in worship evaluation is only possible if we have enough humility to admit we love God and the church more than we love unfettered control. Evaluation is already occurring in our halls and parking lots. Crowdsourcing lets our congregations know we too value those assessments in our worship planning, preparation and presentation. When the British colonized India in the 1820’s they also introduced the game of golf. A unique problem was quickly discovered, however, after building the first golf course in Calcutta. Monkeys in the trees surrounding the course would drop down, snag the golf balls from the fairways and then carry and drop them in other locations. In response, officials tried building tall fences around the fairways and greens but the monkeys climbed right over them. Attempts to frighten them just seemed to amuse and entertain them. Workers even tried to capture and relocate the monkeys only to have others appear. A stellar drive down the middle of the fairway might be picked up and dropped in the rough. A hook or slice producing a terrible lie might be tossed back into the fairway. So golfers quickly learned that if they wanted to play on this course they couldn’t always control the outcome of the game. Resilience finally helped the officials and golfers come up with a solution. They added a new rule to their golf games at this course in Calcutta…Play the ball where the monkey drops it. The elasticity of resilience is also a great characteristic for worship leaders to learn and develop. It encourages recovery with grace instead of overreaction in anger when the service doesn’t go as intended. Resilience averts relational catastrophe when people don’t do or plans don’t go as well as we prayed and practiced for them to. Even though worship leaders have the responsibility to prepare with excellence they must also learn how to present with pliability since the outcome of the service is not really theirs to control. So the next time the organist and pianist begin a song introduction in different keys; the next time the lead guitarist forgets to move his capo; the next time the tech team doesn’t turn on your microphone or forward the text to the next slide; the next time the soprano section comes in too soon; the next time your bass player misses the first service because he forgot to set his alarm; or the next time your pastor cuts a well-rehearsed song right before the service to provide more sermon time…Play the ball where the monkey drops it. “I will bless the Lord at all times; His praise shall continually be in my mouth” (Psalm 34:1). If our church services convey that worship starts and stops with a song set and can be contained in a single hour on Sunday, then we are teaching our congregations to speed date Jesus. Being made in the image of God means that we were created to act the way God acts. Since He is the continuous outpourer, we bear his image as continuous outpourers. Whatever character or attribute God inherently possesses and pours out, we were created finitely to show and to pour out after his manner. So we are falling short of loving God with all our heart, soul, mind, strength and loving our neighbors as we love ourselves when we expend all worship resources on a weekly gathering and have nothing left for what should be a daily occurrence. “Through Jesus, therefore, let us continually offer to God a sacrifice of praise – the fruit of lips that openly profess his name” (Hebrews 13:15). Harold M. Best, Unceasing Worship: Biblical Perspectives on Worship and the Arts (Downers Grove: InterVarsity, 2003), 9. If our Sunday worship gathering was the commencement rather than the culmination of worship? If worship leaders empowered rather than enabled worshipers? If our worship impacted culture instead of always trying to imitate it? If worship fights were over what we offer or give instead of what we demand or deserve? If whom we lead held as much value as how and what we lead? If “what’s in it for me” never surfaced in our worship conversations? If predictable, scripted, explainable and rational weren’t always worship prerequisites? If we spent as much worship service time in prayer and scripture as we spend promoting new songs or protecting old ones? 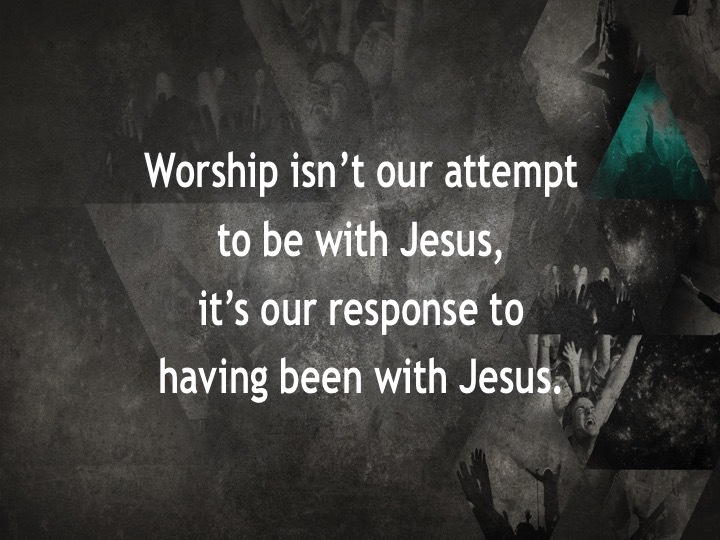 If our goal in initiating worship change was how we can add to rather than take from? If worshipers viewed themselves as travelers on a continuous journey rather than tourists visiting a site for pleasure? If we planned worship for the people we have instead of the ones we wish we had? 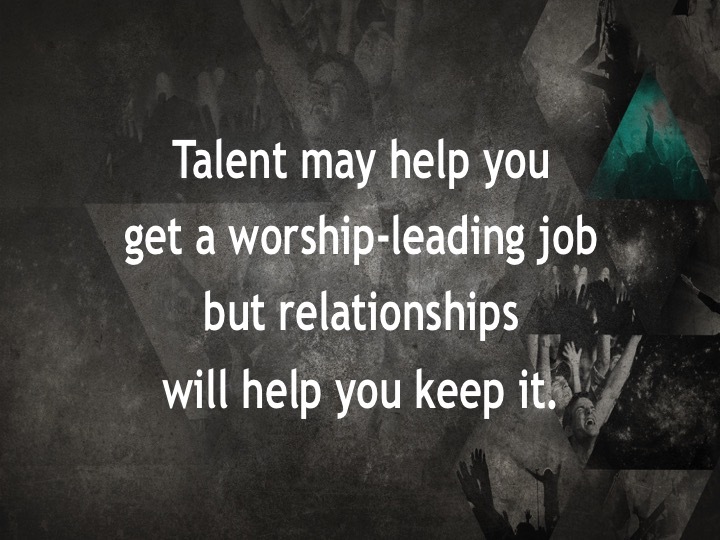 Do you have a hard time recruiting and retaining worship volunteers? Does it seem like you are constantly enlisting and replacing individuals in your worship band, choir, orchestra, tech team or children and youth music ministries? Is it possible the reason isn’t their lack of commitment or conviction, but instead something you as the primary worship leader and the ministry organization are or aren’t doing? In the late 1990’s the Gallup Organization performed a research study asking over a million people from a variety of companies and organizations what the most talented employees need from their workplace. Their results indicated that even though talented employees might have initially joined a company because of a variety of incentives, they actually stayed and were more productive because of their relationship with their immediate leaders. They then asked over eighty thousand business leaders how they find, focus and keep talented employees. They discovered that measuring the strength of a workplace could be achieved by asking employees to respond to twelve simple questions developed through their research. Their responses help the employer determine if employees are engaged, not engaged or actively disengaged at work. The study and results were used as the foundation for the book, First, Break All the Rules: What the World’s Greatest Managers Do Differently by Marcus Buckingham and Curt Coffman. Are you asking critical questions to determine why your worship volunteers are engaged, not engaged or actively disengaged? Part of our problem with retention is that we don’t often ask any questions at all, that is until it is too late. The twelve Gallup questions might not be the right questions for a worship leading context. But what if they are? What if our worship volunteers answered these or similar questions and their responses caused us to adjust our culture? And what if those adjustments consequently encouraged volunteers to stay and succeed? Do I know what is expected of me in our worship ministry? Do I have the materials and equipment I need to do this ministry well? Do I have the opportunity to do what I do best every time I serve? Have I received recognition or praise for doing good work in the last seven days? Does my leader or someone else in our worship ministry seem to care about me as a person? Is there someone in this ministry who encourages my development? Do my opinions seem to count? Does the mission/purpose of our worship ministry make me feel like my contribution is important? Are my co-volunteers and leaders committed to quality? Do I have a close friend in our worship ministry? In the last six months has someone in this ministry talked to me about my progress? This last year have I had opportunities in our worship ministry to learn and grow? Adapted from Marcus Buckingham and Curt Coffman, First, Break All the Rules: What the World’s Greatest Managers Do Differently (New York: Simon and Shuster, 1999), 11-13. 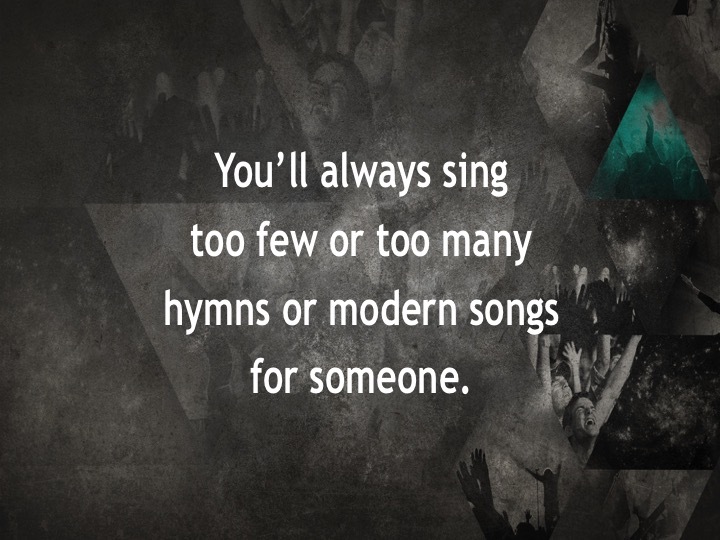 Is Your Church Singing? Send In A Canary! Taking a canary into a coal mine served as a warning system in the earlier days of mining. Canaries are especially sensitive to methane gas and carbon monoxide making them ideal for detecting a dangerous build-up of gas in the coal seam. The canary would begin to show signs of distress in response to small concentrations of gas before it became detrimental to the miners. The first sign of imminent danger was when the canary stopped singing. The idiom canary in a coal mine has continued as a reference to a person or thing that serves as a warning of a looming crisis. Enlisting trusted individuals from your congregation to regularly ask questions not only about the worship singing of your congregation, but also about the way you are leading that singing could alert you and your congregation to imminent conflict while there is still time for restorative care. Intentionally adopting an early warning system is a pre-emptive process of enlisting congregational canaries to ask questions before it is too late. It is vital to enlist those who love God, love the church and love you enough to honestly evaluate your leadership and assess the level of congregational participation. The humility necessary to initiate a process such as this can only occur if you also love God, love the church and love the people enough to trust their assessment and have a willingness to sacrifice your own interests for the greater good of your church. Is our congregational singing passive or participative? Are idiosyncrasies or characteristics of our leaders encouraging/discouraging congregational participation? Are the songs vertical and horizontal, celebrative and contemplative, comforting and disturbing? Is the song text theologically sound and does it affirm scripture as foundational? Is the text trite or archaic, repetitive or diverse? Are song selections culturally appropriate for our congregation? Do our songs encourage conversational worship that includes God’s words to us as well as our words to God? Are leaders incorporating musical elements that distract our attention from that conversation? Does our worship space encourage/discourage participation in congregational singing? Are transitions smooth, tempos satisfactory, volumes appropriate and keys singable? Are physical actions actively encouraged/discouraged? Do the songs give our congregants an opportunity to connect with one another? Are guests able to participate in the congregational singing without confusion? Is our singing a worship asset or liability? Baseball utility players are prized for their versatility even though they don’t have enough talent to crack the starting lineup. They are usually excellent players but not quite good enough to help carry the team from a starting position. A utility player is more supplemental than foundational to the success of each game. So he waits on the bench until the manager needs him to fill any of a variety of positions in the lineup. Prayer has been relegated to the role of a worship service utility player. It is often plugged into worship service holes when the starters (songs and sermons) need a break. Instead of a foundational conversation with the Father as an act of worship, prayer is often a supplemental extra used to fill in, transition or connect. We often keep prayer on the bench in our services until we need it for a breath of fresh air before a long service section, to allow the worship leader to move his capo, to transition the service stylistically, to shift ushers to their places or to discreetly move the worship band onto the platform. Worship service spontaneous prayer has evolved into predictable pray-ers praying predictable prayers in predictable places. So when we need to fill a gap we can always depend on our go-to utility player…prayer. Praying spontaneously, meaning it is ready and available without thinking often means it is available without thought. Spontaneity may be convenient but it is not often very meaningful. What if our preparation expectations were just as stringent for leading in public prayer as they are for a worship service soloist, worship band song or choir anthem? Wouldn’t our worship be radically impacted if spent as much time actually praying in private and public as we now spend trying to teach new songs or protect old ones? Shouldn’t prayer be foundational rather than supplemental, a key player rather than a sub and a worship sustainer rather than a worship stuffer? It can’t cause or cure church conflict. It can’t grow or kill your church. It can’t begin or end worship. It can’t take the place of Scripture. It can’t serve as our only act of discipleship. It can’t be contained in one genre or style. It can’t prop up bad theology. It can’t take the place of prayer as our primary conversation with God. It can’t be contained in one emotion. It can’t convict or inspire without the Holy Spirit. It can’t manufacture worship renewal. It can’t cause multigenerational, multicultural or multisensory worship. It can’t create community that is only available at the Communion Table. It can’t cause Jesus to show up. It can’t be our only act of worship. Preaching is the act of publicly proclaiming, teaching or making something known. It exhorts, exposits, affirms, corrects, advocates, instructs, responds and applies. The act of preaching communicates to us, for us and through us. A sermon is preached to address and expound on the biblical, theological, doctrinal and moral issues that impact every generation of every congregation each and every day. And this connectional discourse is intended to challenge those congregants not only to embrace these truths individually but also corporately. 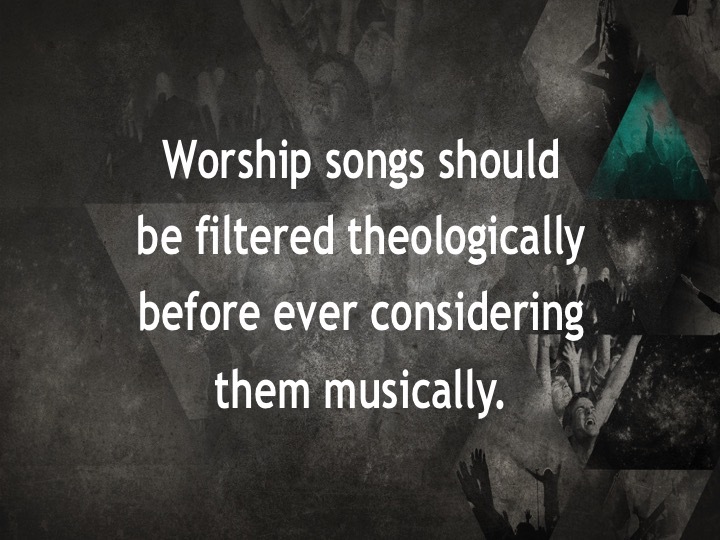 So if the worship songs we select aren’t complementing, resonating and emulating these same characteristics, we probably need to select different songs. In other words, our songs must also preach. Our Songs must reflect and respond to biblical text. Scripture must organically yield our songs instead of just fertilizing our own contrived language. We must constantly ask if our song text is theologically sound and if it affirms Scripture as central. Songs that do not provoke a response to the Word don’t preach. Our Songs must connect the Word of God to the people of God. The dialogue of worship through our songs is formed when God’s Word is revealed. This revelation causes the people of God to respond through the prompting of the Holy Spirit. The result is a vertical conversation with God and horizontal communion with others. Our songs are the communally uttered words of God. Our Songs must speak the Gospel. Every song we sing must invite the congregation and guests to be a part of God’s story through Jesus Christ. Our songs should help us understand what God is up to in and through our lives in the name of Jesus. Those songs must sing of the ongoing and enduring work of God through his son, Jesus Christ. And they must constantly remind us that Christ has died, Christ is risen and Christ will come again. Our Songs must be easy to follow and understand. If congregants can’t follow our songs, then they have difficulty finding value in those songs and consequently can’t be influenced and moved to respond to them and through them. Archaic or colloquial text should be filtered and melodies should be evaluated for singability. 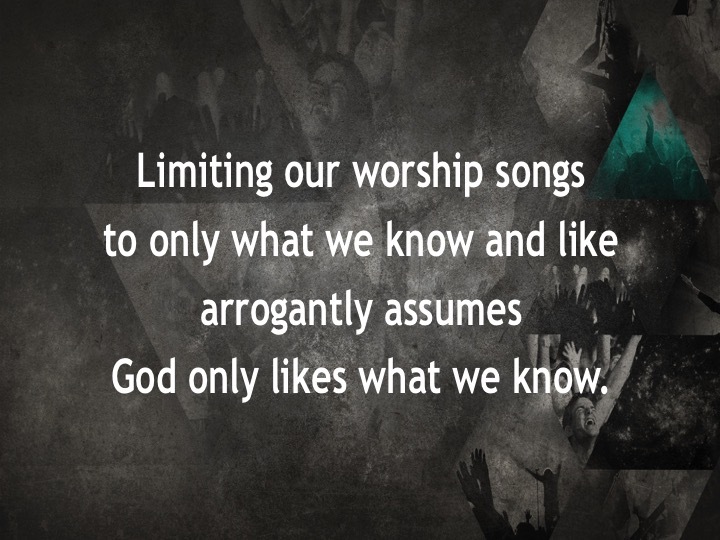 Songs that are difficult to follow contribute to ineffectual song sermons. Our Songs must be sung with integrity. Songs that preach communicate biblically, theologically and doctrinally. Our songs must be sung with the integrity of adequate external preparation that springs forth from internal conviction. It must be evident that our songs reflect what we believe and practice. Lives must replicate the texts we sing even when we aren’t singing them. Songs sung with integrity engage and express biblical text with inspiration and conviction. Our Songs must engage more than emotions. Scripture encourages us to love the Lord our God with all our heart, soul, mind and strength. Songs that just stir the emotions are incomplete; Songs that do not begin from the depth of our soul are often trite; Songs that don’t require us to think are shallow; and Songs that don’t ask us to use our bodies as a living sacrifice in acts of service are selfish. So our songs must be sung from our entire being. Our Songs must encourage action. Songs must not only inspire us through our hearing but also challenge us in our doing. They must not only inform the congregation but also engage them. Singing our songs should cause us to ask what is going to change as a result of singing them. Singing in here is not enough until our songs also impact who we are out there. So the songs we sing in our worship service must lead us to acts of service as worship. If our worship leadership conveys that worship starts when we start it and ends when we end it; if we expend all resources and energy preparing for and presenting a single hour (or two) on Sunday and have nothing left to encourage worship the other hours of the week; if we aren’t exhorting congregants and modeling for them how to worship not only when we gather but also when we disperse; then we are creating worship dependents. Worship Dependency is conditional or contingent on something or someone else. Worship Dependency saves it until Sunday and waits for someone else to initiate it. Worship Dependency has to start over every Sunday. Worship Dependency increases worship conflict since we only get one shot at it each week. Conversely, when worshipers are no longer dependent but are instead empowered, they are encouraged to engage in a perpetual cycle of continuous worship. What occurs on Sunday is an overflow of what has already been occurring during the week with the added benefit of getting to share it with others. The weekly gathering is then the culmination of our daily occurrences. Worship Empowerment leads to the full, conscious, active and continuous participation of worshipers. Worship Empowerment increases the capacity of individuals to recognize God’s revelation and challenges them to transform that revelation into a response…worship. Worship Empowerment equips others to think, behave or take action autonomously. Worship Empowerment encourages congregants to respond to God’s revelation in the moment it occurs. Worship Empowerment focuses on what we can do and who we can be out in the world beyond Sunday and starts every day where we left off the day before. Worship Empowerment reduces worship conflict since we get multiple shots at it each and every day. If those of us who lead gathered worship are not careful, our actions can imply that time and place Sunday worship is the primary, if not only venue for worship, while the remainder of our life falls into another category. When writing about building relationships in social environments, Ray Oldenburg outlined various places where we connect with others in society. He calls the first place a person’s home and family. The second place is the workplace or school, where people may actually spend most of their time. And the third place is an informal location that is always welcoming and comforting. Worship leaders…we must teach them, lead them, exhort them and model for them how we can worship not only when we meet but also when we disperse. Neither should be minimized, as both are indeed places for worship. The divide, however, is when we expend all resources on our weekly gathering and have nothing left for what should be a daily occurrence. Worshiping in other places should never require us to compromise biblically, theologically or doctrinally but will often require us to accommodate culturally, contextually and systematically. When worship occurs in those other places it is no longer just what we do in here but also who we are out there. Then what occurs in here on Sunday is an overflow of what has already occurred out there during the week. Ray Oldenburg, The great good place: Cafés, Coffee Shops, Bookstores, Bars, Hair Salons and Other Hangouts At the Heart of A Community (New York: Marlowe,1999). Stepford is the name of the fictional idyllic community in Ira Levin’s 1972 novel, The Stepford Wives. This satirical thriller portrays the women of the community as animatronic robots. The word Stepford, therefore, has come to denote a person regarded as a bland robotic conformist, one who blindly imitates or mimics another or one who does not behave or think independently. Does that sound like the way you plan, prepare and lead worship? It is often easier as worship leaders to imitate the worship habits, methods, styles, presentations and even attire of other artists or congregations. We mimic them without even considering our own gifts and calling or the calling and abilities of our players, singers and congregants. If the only version of worship songs you ever lead or your congregation ever expects must be exactly like that of the original artist (including: genre, key, tempo, instrumentation, vocal timbre, volume, attitude and even attire), then why do they need you? If God has entrusted us with the position to which He has called us, then imitating or mimicking another actually marginalizes that calling. An imitation can never exceed the quality or ability of the imitated or it is no longer an imitation but instead a new creation. So an imitation will always be an inferior substitute for the original. Is that really what God intended for you and the best you have to offer Him and your church? Obviously, not all congregations are gifted with musicians who create original songs and therefore must borrow songs from others. The difference between borrowing their songs and imitating their worship, however, is taking the time to interpret those songs while giving consideration to the uniqueness of your own congregation instead of just attempting to make those songs sound as close as possible to the original rendition. Imitation is about style. Interpretation is about content. Imitation is based on replication. Interpretation is based on revelation. Imitation ignores God’s limitless creativity in multiple contexts. Interpretation acknowledges God’s limitless creativity in your own context. Imitation is an attempt to lead worship by mimicking what someone else has been called to do. Interpretation is an attempt to lead worship by expressing what God has called you to do. Setting aside our ego and placing others first models a level of worship leadership that song selection and platform finesse will never achieve. Author, John Fischer calls it looking out for number 2. Investing in others above us…in people above presentation understands the difference between doing liturgy and being a liturgist. What will your congregants remember most about your worship leadership…how you led them while you were on the platform our how you placed them first on the way to and from the platform? Instead of a desire to be recognized, revered or elevated, maybe our prayer for 2014 should be “Lord, deliver me from myself.” Jorge Luis Borges wrote, “Arrogance is when the image of the Lord has been replaced by a mirror.” Rafael Cardinal Merry del Val (1865-1930), the Secretary of State for Pope Saint Pius wrote the following Litany of Humility that can serve as a reminder when we assume our efforts are indispensable to God or that He can’t get it done if we don’t do it. Core Convictions are foundational standards, principles, values or tenets. The language, comments and questions of the ten core convictions may not all be consistent with the doctrines and practices of your faith community. You are encouraged, however, to view these foundational principles in light of your culture, while giving consideration to their value for the entire ecumenical faith community. On their tenth anniversary in 2007, the Calvin Institute of Christian Worship identified ten core principles that outline their central convictions about vital Christian worship. Their desire in presenting these core convictions was that their many ecumenical partners and contacts would find them clear, compelling and most of all enriching for their own worship and ministry. Worship cultivates our knowledge and imagination about who God is and what God has done. Worship gives us a profound awareness of the glory, beauty, and holiness of God. Each element of worship can be understood through a Trinitarian framework. Worship renewal is best sustained by attention to the triune God we worship. What is the picture of God we are, consciously and unconsciously, cultivating in our worship? In what moments of our worship do we most perceive the glory and beauty of God? In what way does our worship space convey God’s glory? In what way might renewed attention to God’s glory make our worship more contemplative? more exuberant? more vibrant? What barriers does our culture present to worshiping with a sense of God’s transcendence? How does our picture of God help us resist idolatries? Worship is not just what ministers, musicians, and other leaders do; it is what all worshipers “do”—through the work of the Spirit in worship. In vital worship, all worshipers are involved in the actions, words, and meaning of worship. God’s covenant promises endure “from generation to generation.” Worship that arises out of an intentionally intergenerational community, in which people of all ages are welcomed as full participants, and whose participation enriches each other, reflects that worship breaks down barriers of age. How do worshipers in our community understand the nature of their participation in worship? How do worshipers in our community understand the purpose of their participation in worship? What does participation mean in addition to lay leadership of worship? What could we do as worshipers to prepare to be as involved in the actions and in tune with the meaning of worship as we assume our leaders are? How are we enabling the full, conscious, active participation of all worshipers in our worship? How are we failing to enable the full, conscious, active participation of all worshipers? How can our worship be more intergenerational in its lay leadership? How can our worship be more intergenerational in its participation? How can we better foster intergenerational community? What generational barriers does our culture set or lead us to expect? What generational barriers does our own tradition or history set or lead us to expect? The Bible is the source of our knowledge of God and of the world’s redemption in Christ. Worship should include prominent readings of Scripture, and engage worshipers through intentional reading practices, art, and music. It should present and depict God’s being, character, and actions in ways that are consistent with scriptural teaching. It should follow biblical commands about worship practices, and it should heed scriptural warnings about false and improper worship. In particular, Christian worship should be deeply connected to its ancient roots in psalmody. How prominent is the reading and teaching of scripture in our worship? How engaging is the reading and teaching of scripture in our worship? What use of art and music could help us better engage worshipers with scripture? How deeply and broadly do we select biblical passages to read, sing, reflect, and preach from? The sacraments are physical signs of God’s nourishing action in creation through the Holy Spirit. In baptism God puts his covenant mark on his children, adopts them into the church, and calls them to a lifetime of dying and rising with Christ. In the Lord’s Supper, God physically and spiritually feeds his people. These celebrations are not just ceremonies, but gifts of grace and signs of God’s ongoing work. How regularly do we celebrate the sacraments? When we do celebrate the sacraments, how prominent are they in our worship services? How could we do more to nourish a sacramental awareness even (or especially) in services in which they are not held—in preaching, prayers, singing, creeds, professions of faith, and other aspects of worship? Do we treat the font and table with any significance during services in which we’re not using them? How much water do we use in our baptismal font or pool? Could we use more? How would worshipers summarize the theological significance of baptism and the Lord’s Supper? How could we make worshipers more aware of their own baptism and its personal significance for them? How could we make our celebration of the Lord’s Supper more communal? What are some of the most meaningful celebrations of the sacraments you have experienced? Worship should strike a healthy balance among four approaches or dimensions to its cultural context: worship is transcultural (some elements of worship are beyond culture), contextual (worship reflects the culture in which it is offered), cross-cultural (worship breaks barriers of culture through worship), and counter-cultural (worship resists the idolatries of its cultural context). What aspects of our worship are transcultural? What aspects of our worship are inculturated? What aspects of our worship are cross-cultural? What aspects of our worship are countercultural? Which of these four approaches comes most naturally to our worshiping community? Worship is enriched by artistic creativity in many genres and media, not as ends to themselves or as open-ended individual inspirations, but all disciplined by the nature of worship as a prophetic and priestly activity. How are we incorporating the arts into our worship? How are we mediating the danger of not neglecting visual aspects of worship but not idolizing them, either? How can we better incorporate artists into our community, and cultivate the artistic gifts within our worshiping community? Congregational worship is mutually enriching to the full range of congregational ministries, including pastoral care, education, spiritual formation, and witness. What are some of the ways we are integrating our worship with the full scope of our congregational ministry and life together? How can we better integrate worship into our ministries of evangelism, fellowship, education, pastoral care, and others? A central feature of worship is that it breaks down barriers to welcome all worshipers, including persons with disabilities, those from other cultures, both seekers, lifelong Christians, and others. How does our worship currently express hospitality to all worshipers? How does our worship currently express hospitality to those with special needs? How does our worship currently express hospitality to visitors? How can we better express hospitality in our worship? Worship fosters natural and dynamic connections between worship and life, so that the worship life of Christian congregations both reflects and shapes lives of grateful obedience, deeply engages with the needs of the world, including such specific areas as restorative justice, care for the earth, and many other areas. How does our worship currently express connections between worship and other areas of life? Does our worship foster a sense that our common faith is primarily relevant only in worship, or foster a sense that worship is one aspect—though a very important one—of our service to God? Worship involves a collaborative process for planning and evaluating services in the context of an adaptive approach to overall congregational leadership. How collaborative is our current process of worship planning? How collaborative is our current process of worship evaluation? How could our worship planning be more collaborative? How could our worship evaluation be more collaborative? If you have to inhale to wear skinny jeans…don’t. No flip-flops. The platform lights have a tendency to magnify ugly feet and some people still refer to flip-flops as thongs. Cleavage (guys or girls) may be acceptable on the red carpet at the Emmy’s but not on the powder blue carpet in the worship center. White slacks maximize the appearance of your lower extremities…do you really want to look like a bridge pylon on the platform? Drummer…the crash cymbal is like a fine wine meant to be enjoyed on special occasions and intended to be sipped not chugged. Lead Guitarist…did you know the congregation can actually see you? Less is more when it comes to low-slung guitar gyrations. Singers…consider your facial expressions (contortions). Is that conviction we are seeing or the consequences of your breakfast burrito? Singers…please respect the other team members. Not everyone enjoys your morning breath as much as your dog does (see breakfast burrito above). Tech Team…Using Comic Sans font doesn’t make the late slide transitions any more humorous. Worship Leader…when considering verbal transitions; know the flight plan and how to land the plane before you leave the runway. What Must We Sacrifice for Our Children? Sacrifice is surrendering for the sake of something or someone. It is the act of giving up, offering up or letting go. A baseball bunt is a sacrifice for the sole purpose of advancing another runner. Executing this sacrifice is called laying down a bunt. What if parents and grandparents had that same disposition when it came to their musical preferences? Sacrificing our worship preferences is only possible when our common ground is deference instead of preference. Deference is a learned and practiced submission based on conviction…preference is based on feeling and tradition. Deference encourages worshipers to respond in spite of the traditions and embedded theology that previously influenced their thinking and actions. Deference is the agreement that although we may not always like the music of our children and grandchildren…we are willing to sacrifice our own preferences because of our love for those children and grandchildren. Mitch Albom, The Five People You Meet in Heaven (New York: Hyperion, 2003). Gary A. Parrett and S. Steve Kang, Teaching the Faith, Forming the Faithful: A Biblical Vision for Education in the Church (Downer’s Grove: Intervarsity, 2009), 152. Terry W. York and C. David Bolin, The Voice of Our Congregation: Seeking and Celebrating God’s Song for Us (Nashville: Abingdon, 2005), 108. The beginning of another football season reminds us of a practice that could also be beneficial to worship leading teams. Breaking down game film is the discipline of reviewing game videos in order to identify mistakes, make adjustments, consider radical changes and highlight successes. The ultimate goal of this type of analysis is to facilitate individual and team improvements that will positively affect subsequent games. It is often difficult to recall after the game what did or didn’t work during the game. The fundamental reasons why a team is unable to stop or move the ball is not always evident in the middle of the action. Breaking down the film after a game gives coaches the opportunity to isolate individual players and plays in a more relaxed setting away from the time constraints and pressures of the game. Why aren’t worship leading teams regularly incorporating similar practices? Implementing a post service process of analyzing worship service videos would definitely require a level of humility, trust and shared accountability. It would also require selfless leadership that understands sacrificing ones own interests for the greater worshiping good of the congregation. And those sacrifices would positively affect subsequent worship services. Breaking down worship service film is always more comprehensive, meticulous, precise and ecumenical when you enlist others to participate with you in the analysis. Communal observations and the wisdom with which to respond to those observations will always be strengthened through the involvement of a collective group. Armchair quarterbacking is already occurring in the halls and parking lots after the services. Breaking down worship service film intentionally initiates an analysis process that pre-empts those congregational critics who love to coach from the stands. The primary reason for breaking down worship service film, however, is that it will encourage your worship leading team to consider worship renewal based on prayerful evaluation, not just as a knee-jerk response to worship conflict. Want Healthier Worship? Gotta Serve Somebody! It doesn’t matter how good our worship is in here, it is still incomplete until it also includes how we live and treat others out there. The great theologian, Bob Dylan got it right when he wrote, “You’re gonna have to serve somebody.” Service is continuous; it just depends on whom or what you are serving…self or others. Service is the action that we take to ensure that worship will continue when we leave the worship gathering. We spend so much time leading church services as an act of worship that we often neglect to lead the church in service as an act of worship. And even though we call our Sunday gathering a worship service, not a lot of service actually occurs. Service as worship never compromises biblically, theologically or doctrinally but often requires us to make adjustments in order to accommodate culturally, contextually and systematically. We sing psalms and hymns and spiritual songs as an expression of our desire to know Jesus, but the Jesus we want to know is the sanitized Jesus that looks a lot like us. Despite God’s Word to the contrary, we think we can say we love God and yet hate our neighbor, neglect the widow, forget the orphan, fail to visit the prisoner, ignore the oppressed. When we do this, our worship becomes a lie to God. The prophet Micah condemned Israel’s dishonest, corrupt, and meaningless worship actions by pointing out what God considers good worship and what he really requires of our worship. “He has shown you, O man, what is good. And what does the Lord require of you? To act justly and to love mercy and to walk humbly with your God” (Micah 6:8). Service as worship acts justly. A congregation that acts justly is one that is welcoming. Most can answer affirmatively when asked if their worship welcomes those not like them…all are welcome if or when they come. Welcoming, however, actively embraces those who are not and may never be present. Welcome primarily focuses on the needs of the congregation that occur on Sunday. Welcoming, on the other hand, focuses also on the needs of the world that occur every day. Welcoming loves, honors, and praises the Father by loving those He loves. Service as worship loves mercy. If anyone says, “I love God, (an act worship) yet hates his brother, (also an act of worship) he is a liar” (1 John 4:20). Service is when we as individuals and our congregation as a body realize that loving God by loving my neighbor as I love myself is a profound act of worship. Mercy agrees that no stipulation should be required as to whether that neighbor has earned or deserves the right to be loved. Mercy affirms…These people are also made in God’s image and serving them is worship. Healthier worship is encouraged when leaders begin modeling, teaching and leading their church not only in gathered worship services but also dispersed worship as service. Neither should be minimized, as both are indeed acts of worship. The divide, however, is when we expend all our resources on a weekly gathering and have nothing left for what should be a daily occurrence. Mark Labberton, The Dangerous Act of Worship: Living God’s Call to Justice (Downer’s Grove: InterVarsity, 2007), 13. It doesn’t matter if you are a worship-leading novice or aging veteran; you have inevitably looked back at certain services, special events, entire seasons of ministry or various relationships with a deep longing for a second chance to do or handle things differently. The reality is that it would be impossible for us to go back and make corrections to most of those situations. We do, however, have the opportunity for another chance to get it right when we face similar circumstances in the future. One way to learn from the past in order to influence the future is to recall those events and write down how we might handle them differently if we had a mulligan. You may resonate with some of my examples but I also encourage you to create your own list…it’s pretty therapeutic. I’d make more mistakes because I took more risks. I’d learn more people’s names than new songs. I’d learn the musical language of chord charts, capos, and cajons sooner. I’d take a Sabbath every week. I’d make more deposits in younger leaders and withdrawals from older leaders. I’d pray for and defend my pastor even when he didn’t deserve it. I’d surround myself with those who stretched my thinking and held me accountable. I’d leave more things at the office when I came home in the evening. I’d read more, study more, learn more and ask more questions. I’d ask how it might impact my family before asking how it might impact my ministry. I’d learn more theology than musicology. I’d learn how to do a variety of things in addition to worship leading. I’d take more time and get more buy-in before initiating change. 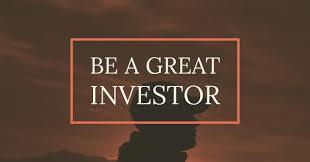 I’d spend more time thanking those who invested in my life and ministry. I’d have more patience with needy people or chronic takers. I’d develop more hobbies outside of the church. I’d welcome more divine interruptions in my planned schedule. I’d write more things down. I’d thank those who protected me from my own stupidity. I’d evaluate my year based on in-betweens not big events. I’d teach people how to worship when they leave not just when they arrive. I’d stay with things longer instead of bailing when things got difficult. I’d celebrate the Lord’s Supper/Communion/Eucharist more often. I’d focus on music less and worship more. 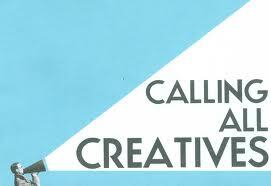 I’d schedule large blocks of time to think creatively. I’d drink more coffee with senior adults. I’d lighten up, play more and not take myself so seriously. I’d figure out how to get grandparents and grandchildren to worship together. I’d have more “can you imagine” conversations than “do you remember” ones. I’d spend more time learning how to be a better leader than a better musician. I’d have more ministry friends outside my faith culture or denomination. I’d realize that it is never too late to begin doing any of these things. If I sing like my favorite worship artist, but do not have love, I am just a loud kick drum or cheap crash cymbal. If I have the gift of creative verbal transitions and understand the mystery and knowledge of chord charts and choir scores, and if I have the faith that can move the emotions of an entire congregation, but do not have love, I am nothing. If I give the old sound system to a poor congregation, install the new one all by myself, and then post it on Facebook so all my friends will know, but do not have love, I won’t get any likes. Love is kind to the tech team. It doesn’t incessantly promote itself on YouTube. or keep track of the times it has happened before. so it encourages a culture of mutual accountability. and always rehearses just one more time. where there is musical knowledge, it will pass away. but when Perfect Worship occurs, the kind-of will disappear. When I was a child, I sang childish songs. When I became a man, I traded childish songs for adult songs…but still just songs. For now we see hazily, as through the mist of a fog machine. But soon the haze will evaporate and the room will be completely clear. Now I kind-of know; Then I will fully know, even as I am fully known. Until that time, until we fully know, we must do three things: Have Faith that God will help us; Hope that we are getting it right; and Love God and each other. As a worship leader, love often seems to be the hardest…but it is also the greatest. Most of us can’t imagine operating a lawn mower or power tools without hearing protection and yet regularly operate our worship sound reinforcement systems at a comparable decibel level. We all know volume complaints are more prevalent when the musical style is one the complainant doesn’t particularly like. But the reality is that decibel levels are no respecter of persons or styles. An organ introit, choir and orchestra anthem, rhythm section bridge, or southern gospel quartet all have the same potential to hover around unsafe or even damaging levels with extended exposure. In fact, some studies have even shown that incidents of hearing loss are slightly higher in classical musicians than rock musicians. Even though our volume preferences may be subjective, the potential effects are not. Worship and Tech leaders often use the Occupational Safety and Health Administration (OSHA) decibel scale to determine acceptable levels. Although a helpful resource, it is often used reactively rather than proactively. In other words, leaders often use this scale to defend existing levels in response to complaints. Proactive use of the OSHA scale can instead help a congregation consider not only acceptable levels but also appropriate levels for the culture of their individual congregation. Acceptable levels are objective…Appropriate levels are subjective. Appropriate levels consider the congregation we have been given to lead, not one we wish we had been given to lead. In most cases it would require only slight adjustments to reduce the risk of hearing damage or loss. Experts have written that based on the length of time of exposure vs. the intensity of exposure, every 3 dB drop reduces the risk by one-half. Even though humans are very good at determining and measuring frequency, they are not very good at determining loudness, or differences in loudness. In the noisy environment of a worship service with numerous instrumentalists and vocalists playing and singing simultaneously, a 3 dB drop of the band or orchestra would be imperceptible to most congregants. Slight adjustments would foster significant progress toward safer worship music levels for longer periods of time. As leaders, we can rationalize unsafe decibel levels because it feels better, because it fits the genre, or because we prefer it at those levels. And yet, we often vilify those congregants who make those same claims about their preferences. It is really just a matter of our responsibility and accountability as leaders to fulfill our obligation to steward those we have been entrusted to lead. How are we doing? Marshall Chasin, Hearing Loss in Musicians: Prevention and Management, (San Diego: Plural Publishing, 2009). You’ve had recurring nightmares about showing up in your underwear to lead the Christmas music. You remember when banjos and mandolins were popular the first time. Your version of a click-track is tapping a pencil on your music stand. You remember when using split-track cassettes was living on the edge. Business Casual meant wearing a leisure suit. Your former youth choir members are now parents of former youth choir members. You couldn’t wait to sell the church Hammond B3 and Leslie speaker 25 years ago at the youth mission trip garage sale for 100 bucks…Oops. Your version of a drum loop is patting a continuous rhythm on your resonant stomach. You considered coloring your hair…until you realized it wasn’t available for ears and noses. You’ve managed music budgets that included hymnals, overhead projectors, a video projector the size of a compact car, and a digital projector the size of a Kleenex box. The attire for any of your music groups ever included white pants and vests. Planning Center was the location where you and the pianist met every Sunday morning to select the hymns with no sharps. You’ve ever asked a congregation to turn over in their hymnals. A Capo reminds you of Don Corleone in the Godfather. No individual worship leader has enough creativity, insight, or endurance to plan, prepare, rehearse, and lead multigenerational, multisensory, and multicultural worship services in multiple styles week after week, year after year, with the same level of spiritual depth and creative tenacity each and every time. Attempting it will eventually kill you and the worship of your congregation. Both may be slow deaths, but still terminal. Enlisting various artistic and administrative creatives to serve with you on a Worship Design Team or Creative Worship Team or whatever you choose to call it provides your congregation a unique worship voice far beyond the voice you could have offered individually. Those enlisted creatives can also serve as liaisons for and with the various generations and cultures of your congregation. A Filter – That sifts through the various ideas to allow the usable materials to surface and the ineffectual materials to be discarded. A Buffer – That lessens or moderates confusion or conflict by representing not only the team but also the various cultures and contexts of your congregation. A Promoter – That expands the level of communication to and encourages buy-in from numerous circles of influence. An Encourager – That inspires and emboldens you as the worship leader, each other as collaborators, and your congregation as participants. An Evaluator – That celebrates and reassesses after each service from an environment of brutal honesty but also profound trust. The worship leader who leads from the impression that he/she alone has the ability, creativity, and even right to be the sole creator of the worship service often cares more about guarding territory than helping the congregation participate in spirit and truth worship. If you alone are holding onto the worship process as a creative gatekeeper in order to receive the credit when something works…just remember that you alone will also receive the credit when something doesn’t. Worship leadership is not what you do for or to your congregation it is what you do with them.